What a surprise is this completely unexpected comeback of ['ramp]! After the too long silence which followed the Astral Disaster album, I thought that Stephen Parsick had put an end to ['ramp] And bang! I received an e-mail, followed by a promotional CD. And what a comeback my friends! The least that I can say is that the man in black of an EM of the styles of Doombient, experimental and\or Berlin School is in great shape. After a so said creative absence of 5 years Stephen Parsick delivers an opus which starts right where the complex rhythms and the Mephistophelian vibes of Steel and Steam and Return had engendered this small jewel which is Astral Disaster. And our chummy Stephen has lost nothing of his ardor, or his creativity by presenting a wonderful album without burrs. An album built around these multilayers of rhythms which get wind up and twist in intrusive magma without ever flooding the leading structure. And the ambiences? ['ramp] goes even farther by injecting a modern psychedelic approach where the border between the reason and the insanity is constantly offended. A majestic album my friends, which covers with shame those who had lost sight, from eyes to ears, the music of this brilliant artist for whom Berlin School has never had of secrets, nor borders. The title-track uncorks this “synchronize or die” with delicate oscillating sequences which alternate their skipping in a passage where the void is eroded by a thin layer of crackling. A heavy sequence makes roar its pace like a mobile staircase which goes up the endless skies. Stephen Parsick has become a master in the art to sculpt and to stick into a symbiosis those multilayers of rhythms which come out of nowhere. This signature is coming to mind when a 3rd structure of rhythm flickers all over the eternal ascent of the main rhythm. Stephen Parsick also reminds us that he knows very well how to handle the minimalist structures by adding effects which dance lightly and gambol around the progression of "synchronize or die". These effects add a dark dimension and give even an impression to modify the pace of a rhythm which is losing some of its sonic fluids. These fluids breakup of the main movement to forge small harmonious buckles which go and come pecking at this big rhythmic anaconda of which the hypnotic charm becomes even magnetizing with the subsequent listening of this small jewel from ['ramp]. And if this long introductory title-track refuses to give itself to a melodious approach so attractive that we could whistle it, "2600" brings this attractive dimension to the music of the man dressed of coal. Nevertheless, its rhythm is heavy and resonant. And its step is hopping is melodious. A strange melody which shivers and hesitates to reveal its charm in a fascinating universe of white noises and other noises as vaporous than the murmurs of ectoplasms roasted by electricity. This harmonious pace which rolls in loops also scatter its strands which melt themselves in a surrealist décor amplified by an electronic fauna as much rich than creative from where is born, at the gate of the 5th minute, another melody which will eat your eardrums. The arpeggios flutter in a hypnotic pattern which is reminiscent of those of Redshift or Arc, except that the ambiences get out of the chthonian abyss unique to ['ramp]. "hanging gardens" is the master title of “synchronize or die”. The main sequence is heavy and resonant in a structure which allies all the vibes of the Doombient style in a crossroads of secondary rhythms which roll up and attack the vibrations of the master rhythm. 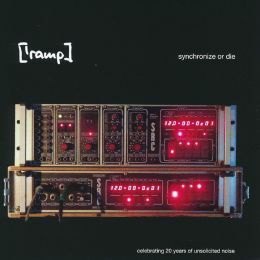 The cracklings of the opening are quickly chased away by the turbulence of the rhythms which wind and spin throughout the 21 minutes of this title and where the major skeleton plays innocently with its ascending and motionless pace and of which the static effects fill our ears and the humming makes tremble our walls, at the point to worry the neighbors. Even in its minimalist shell which moves forward with difficulty and by groping, "hanging gardens" irradiates constantly of new phases of rhythm and neighboring melodies which sparkle like in a 3rd dimension and scatter jewels of tones with elements of charms which make that these 21 minutes pass without sigh of boredom. This is a solid track which will bring back ['ramp] and Stephen Parsick to their place in the firmament of EM. Slendid! As so improbable as that can appear, there is some music on this album which could plays on the waves of a FM radio. I think of "torque" which distances itself with a very good melody blown in the fluty charms of a Mellotron. The rhythm is structured on a meshing of pulsations and percussions. Skipping vigorously and tenacity from an ear to the other one, it takes great care of this melody which reminds the universe of Tangerine Dream in the years of Ricochet. With a title such as "godzilla" we expect something monstrous. Prince without laughing, Stephen Parsick proposes an introduction weaved in the analog mist and fog of the 70's. Playing on the same theme of fright as in Jaws, but slower, he sculptures the threatening pulsations of his beast. And "godzilla" emerges quietly from the deep a little before the 4th minute. I let you imagine what is coming! In a structure of rhythm which comes, disappears then comes back with this feeling of threat, "godzilla" roars with all the power of the analog tones. The sequences are fat, juicy and they crawl with heaviness while the ambiences are just like the universe of this beast that we still don't if we like it or not. “synchronize or die” marks a triumphant comeback of Stephen Parsick in the wonderful universe of EM. It's heavy and dark with nests of rhythms which hang onto the long minimalist movements of the main rhythms. I know that there is not just ['ramp] which succeeds very well in this universe of complexity, but Parsick is the best one that can harmonize all these patterns which teem like the exodus of a nest of snakes into some phases of even more complex moods and always well imagined in order to fit to the forms of the initial rhythm where always are hide some harmonious thin lines. A huge album my friends. And I have to underline that with recent comebacks of Node and Lambert, as well as the last albums of Arcane and Arc, EM is very alive and well and has never felt better! Go get it before the 300 CD go out of print. Quel surprise que ce retour tout à fait inattendu de ['ramp]! Après le trop long silence qui a suivi l'album Astral Disaster, je pensais que Stephen Parsick avait mis le point final à l'aventure ['ramp]. Et bang! Je reçois un courriel, suivi d'un CD promotionnel. ['ramp] est de retour! Et quel retour mes amis. Le moins que je puisse dire est que l'homme en noir de la MÉ de style Doombient, expérimentale et/ou Berlin School est en grande forme. Après une absence créative de 5 ans Stephen Parsick délivre un opus qui reprend là où les rythmes complexes et les ambiances Méphistophéliques de Steel and Steam et Return avaient engendrés ce petit bijou qu'est Astral Disaster. Et l'ami Stephen n'a rien perdu de sa fougue, ni de sa créativité en présentant un superbe album sans bavures. Un album construit autour de ces multicouches de rythmes qui s'entortillent dans des magmas envahissants sans jamais inonder les phases maîtresses. Et les ambiances? ['ramp] va encore plus loin en injectant une approche psychédélique moderne où la frontière entre la raison et la démence est constamment outragée. Un album majestueux mes amis qui couvre de honte ceux qui avaient perdu de vue et d'oreille la musique de ce brillant artiste pour qui la Berlin School n'a jamais eu de secrets, ni de frontières. La pièce-titre débouche ce “synchronize or die” avec de délicates séquences oscillatrices qui alternent leur sautillement dans un passage où le vide est érodé par une mince couche de grésillement. Une lourde séquence fait rugir sa cadence comme un escalier mobile qui monte les cieux sans fin. Stephen Parsick est passé maître dans l'art de sculpter et d'attacher dans une symbiose des multicouches de rythmes qui viennent de nul part. Cette signature nous revient à l'esprit lorsqu'une 3ième structure de rythme papillonne autour de l'escalade du rythme principal. Stephen Parsick nous rappelle aussi qu'il sait fort bien manier les structures minimalistes en ajoutant des effets qui dansottent et gambadent autour de la progression de "synchronize or die". Ces effets ajoutent une dimension ténébreuse et donnent même une impression de modifier la cadence d'un rythme qui échappe quelques-uns de ses fluides soniques. Ces fluides se dissocient du mouvement principal afin de forger des petites boucles harmoniques qui vont et reviennent picorer ce gros anaconda rythmique dont le charme hypnotique devient encore plus magnétisant avec les écoutes subséquentes de ce petit bijou de ['ramp]. Et si cette longue pièce introductive refuse de s'abandonner à une approche mélodieuse aussi séduisante que l'on pourrait la siffloter, "2600" amène cette séduisante dimension à la musique de l'homme en habit de charbon. Pourtant, son rythme est lourd et résonnant. Et sa marche est sautillante est mélodieuse. Une étrange mélodie qui grelotte et hésite à dénuder son charme dans un fascinant univers de bruits blancs et d’autres bruits aussi vaporeux que les murmures d'ectoplasmes grillés par l'électricité. Cette cadence harmonieuse qui roule en boucles éparpillent aussi ses filaments qui se fondent dans un décor surréaliste amplifié par une faune électronique aussi riche que créative d'où nait vers la 5ième minute, une autre mélodie mangeuse de tympans. Les arpèges voltigent dans un pattern hypnotique qui n'est pas sans rappeler ceux de Redshift ou Arc, sauf que les ambiances sortent du gouffre chtonien unique à ['ramp]. "hanging gardens" est la pièce-maitresse de “synchronize or die”. La séquence principale est lourde et résonnante dans une structure qui s'allie à toutes les ambiances du style Doombient dans un carrefour de rythmes secondaires qui enroulent et attaquent les vibrations du rythme maître. Les grésillements du départ sont vite chassés par la turbulence des rythmes qui serpentent et virevoltent tout au long des 21 minutes de ce titre et où l'ossature majeure joue innocemment avec sa cadence ascendante et stationnaire et dont le statisme emplit nos oreilles et les vrombissements font trembler les murs, au point d'inquiéter les voisins. Même dans sa carapace minimaliste qui avance péniblement et en tâtonnant, "hanging gardens" irradie constamment de nouvelles phases de rythme et de mélodies adjacentes qui scintillent comme dans une 3ième dimension et sèment des joyaux de tonalités avec des éléments de charmes qui font que ces 21 minutes passent sans soupir d'ennui. Un solide titre qui ramènera ['ramp] et Stephen Parsick à leur place dans le firmament de la MÉ. Superbe! Aussi invraisemblable que ça peut paraître, il y a de la musique sur cet album qui pourrait passer sur les ondes d'une radio FM un peu commerciale. Je pense à "torque" qui se démarque avec une très belle mélodie soufflée dans les charmes flûtés d'un Mellotron. Le rythme est structurant sur un maillage de pulsations et de percussions. Sautillant avec vigueur et ténacité d'une oreille à l'autre, il prend grand soin de cette mélodie qui rappelle l'univers de Tangerine Dream dans les années Ricochet. Avec un titre tel que "godzilla" on s'attend à quelque chose de monstrueux. Prince sans rire, Stephen Parsick propose une introduction tissée dans la brume et le brouillard analogue des années 70. Jouant sur le même thème de frayeur que dans Jaws, mais en plus lent, il sculpte les pulsations menaçantes de sa bête. Et "godzilla" émerge tranquillement des abysses gorgées d'eau un peu avant la 4ième minute. Je vous laisse imaginer le reste! Dans une structure de rythme qui vient, disparaît puis revient avec ce sentiment de menace, "godzilla" déambule avec toute la puissance des tonalités analogues. Les séquences sont grosses, juteuses et rampent avec lourdeur alors que les ambiances sont à l'image de l'univers de cette bête que l'on ne sait toujours pas si on l'aime ou pas. “synchronize or die” marque un retour triomphal de Stephen Parsick dans le merveilleux univers de la MÉ. C'est lourd et ténébreux avec des nids de rythmes qui s'accrochent aux longs mouvements minimalistes des rythmes principaux. Je sais qu'il n'y a pas juste ['ramp] qui se débrouille très bien dans cet univers de complexité, mais c'est bien le seul qui peut harmoniser tous ces schémas qui pullulent comme l'exode d'un nid de serpents en des phases d'ambiances encore plus complexes et toujours bien imaginées afin d'épouser les formes du rythme initial où se cachent toujours des filaments harmoniques. Un grand album mes amis. Et je dois souligner qu'avec les récent retours de Node et de Lambert, ainsi que les derniers albums d'Arcane et de Arc, la MÉ est définitivement en santé! Il n'en tient qu'à nous d'en profiter! By where to begin if someone wants to discover the universe of Paul Lawler and/or Arcane? The discography of the English musician and synthesist is rather impressive with about twenty albums under the names of Arcane, Max van Richter and Paul Lawler. And I don't count the E.P. scattered here and there since a few years (I counted 7) and soundtracks as well. So, I would say that the best way is with this last album; “Arcane : Live @ E-day 2017”. Going back as far as the 3rd album of Arcane, Alterstill released in 2001, this last album that Paul Lawler recorded during his performance at The Enck theater in Eindhoven on last April, makes a too brief glimpse over 18 years of a career which was led under the various artistic banners of the contemporary EM. And here, we are entitled to the strong electronic rock in the colors of Tangerine Dream with structures of rhythm supported by sober and effective electronic percussions, but especially by these movements of sequences unique to the signature of Arcane. It's with a short extract of Opus, from the album of the same name, loaded of a new emphasis that "Introduction to Opus-1" installs well our ears for the 65 minutes which will follow. Tiny sequenced arpeggios gambol naively at the opening of "Philae", introducing the evolutionary rhythm which will cross a beautiful fluty chant before rushing towards a good electronic rock. Rather faithful to the version of the E.P. Landers, but with a stronger sound texture, this version of "Philae" offers a more cheerful melody from a synth which multiplies its harmonious loops in symbiosis with the charge of the rhythm. Each title is linked to together in a soundscape mosaic which is sculpted under the sign of darkness. Under the sign of a music which would fit greatly to an apocalyptic horror movie. This is the way the lively and eager rhythm of "Alterstill 6", after the nebulous vibes of "Dark Star", is making a beautiful return in the past where Arcane sounded literally like Tangerine Dream, era Franke-Froese and Baumann, but with a more contemporary tone here. I believe that "Cloud Surfer" is a new track here. The rhythm is jovial and structured on a good meshing of percussions and sequences which sculpt a kind of gendarmerie gallop. The music offers a beautiful orchestral texture with a synth of which the harmonies can be easily whistled on sequences rolling like bingo balls and which become more lively after 3 minutes. Another title than I didn't find in the catalog of Arcane or Paul Lawler is "The Seven Numbers", a track which presents a heavy and jerky beat with a texture closer of TD of the Tyger years. Afterward, Paul Lawler makes parading a series of more contemporary titles like "Lunar 9", from Landers, "Aphelion 2" from the E.P. of the same name and "Fire Wings" from the Opus album which is very present here with an interpretation always very rock of "Post-Apocalyptic Rodeo" without Zlatko Perica's guitar but with good arrangements and a very melodious synth. It sounds very Logos and it's really in the tone of the concert. "The Taxidermist" brings us in 2004 with the very good 33 1/3 RPM. The structure is slow and hammered by good percussions. The synth and the sequencer make very TD of the Thief and\or Flashpoint years. A very good title from an album which I believe is out of print but which one can find on Paul Lawler's Bandcamp page. This track is the ideal link towards the delicious "Post-Apocalyptic Rodeo". "From Here to Oblivion" is the Encore of this excellent album in concert from Arcane. Here, as on the 11 other titles of “Arcane : Live @ E-day 2017”, everything is played with more strength, with more punch in the rhythmic offensive whereas the melodious approaches remain always weaved in the mysticism with good arrangements and a synth that Paul Lawler harmonizes very well with the vibe that he wants to give to this concert. Fluty and melodious, this synth can also be of ice and of mysteries as here on this very strong interpretation of a title of which the rolls of rattlers stay undeniably the charm of this music bring out of the Revenants album which was released on 2014. We hear a WoW in the assistance. And I believe that describes very well the effect of surprise and of delight regarding the selection of titles that Paul Lawler carefully enriched in a long mosaic, very dependent on each of the titles, which passes by in a wonderful symbiosis, so much at the level of the rhythms as the harmonies, and which disregards some 15 years which separate them. 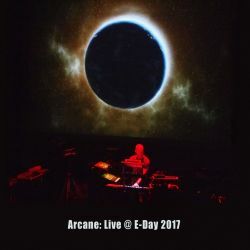 And at the end, “Arcane : Live @ E-day 2017” is a splendid album from a concert which seems to me too short in order to court with accuracy Paul Lawler's vast universe. But it's an excellent way to start! Par où débuter si l'on voudrait partir à la découverte de l'univers de Paul Lawler et/ou d'Arcane? La discographie du musicien/synthésiste Anglais est tout de même assez imposante avec une vingtaine d'albums sous les noms d'Arcane, Max van Richter et Paul Lawler. Cela en excluant les quelques E.P. éparpillés ici et là depuis quelques années (j'en ai dénombré 7) et les bandes sonores. Eh bien, je dirais que la meilleure façon est avec ce dernier album; “Arcane : Live @ E-day 2017”. Reculant aussi loin que le 3ième album d'Arcane, Alterstill paru en 2001, ce dernier album que Paul Lawler a enregistré lors de sa performance au E-day en Avril dernier fait un trop bref survol des 18 ans d'une carrière qui fut menée sous les différentes bannières artistiques de la MÉ contemporaine. Et ici nous avons droit à du très solide rock électronique au couleurs de Tangerine Dream avec des structures de rythme soutenues par des percussions électroniques sobres et efficaces, mais surtout à ces mouvements de séquences uniques à la signature d'Arcane. C'est avec un court extrait de Opus, de l'album du même nom, que "Introduction to Opus-1" installe bien nos oreilles pour les 65 minutes qui suivront. Le son est plus fort et est nourri d'une plus profonde accentuation. Des petits arpèges séquencés gambadent naïvement en ouverture de "Philae", initiant le rythme évolutif qui traversera un beau chant flûté avant de foncer vers un bon rock électronique. Assez fidèle à la version du E.P. Landers, cette version de "Philae" offre un chant plus suave d'un synthé qui multiplie ses boucles harmoniques en symbiose avec la charge du rythme. Chaque titre s'imbrique l’un à l’autre dans une mosaïque sculptée sous le signe des ténèbres, sous le signe d’une musique qui seconderait assez bien un film d’horreur apocalyptique. C'est ainsi que suit le rythme vif et frénétique de "Alterstill 6", après les ambiances nébuleuses de "Dark Star", un beau retour dans le passé où Arcane sonnait littéralement comme du Tangerine Dream, époque Franke-Froese et Baumann, avec une tonalité plus contemporaine. Je crois que "Cloud Surfer" est une nouveauté ici. Le rythme est enjoué et structuré sur un bon maillage de percussions et de séquences qui sculptent une allure de galop d'une gendarmerie. La musique offre une belle texture orchestrale avec un synthé dont les harmonies se sifflotent sur les roulements de billes des séquences qui deviennent plus vives après les 3 minutes. Un autre titre que je n’ai pas trouvé dans le catalogue Arcane /Paul Lawler, "The Seven Numbers" est lourd et saccadé avec une texture plus près de TD des années Tyger. Par la suite, Paul Lawler défile une série de titres plus contemporains comme "Lunar 9", de Landers, "Aphelion 2" du E.P. du même nom et "Fire Wings" de l'album Opus qui est très présent ici avec une interprétation toujours très rock de "Post-Apocalyptic Rodeo" sans la guitare de Zlatko Perica mais avec de bons arrangements et un synthé très mélodieux. Ça sonne très Logos et c'est vraiment dans le ton du concert. "The Taxidermist" nous ramène en 2004 avec le très bon 33 1/3 RPM. La structure est lente et martelée par de bonnes percussions. Le synthé et le séquenceur font très TD des années Thief et/ou Flashpoint. Un très bon titre d'un album discontinué que l'on peut retrouver sur le site Bandcamp de Paul Lawler. C'est le lien idéal vers le trop délicieux "Post-Apocalyptic Rodeo". "From Here to Oblivion" est le rappel de cet excellent album en concert. Ici, comme sur les 11 autres titres de “Arcane : Live @ E-day 2017”, tout est restitué avec plus de force, avec plus de punch dans l'offensive rythmique alors que les approches mélodieuses restent toujours tissées dans le mysticisme avec de bons arrangements et un synthé que Paul Lawler harmonise très bien avec la thématique qu'il veut donner aux ambiances. Flûté et mélodieux, il peut aussi être de glace et de mystère comme ici sur cette très solide interprétation d'un titre dont les roulements de crotales restent le charme indéniable de cette musique qui nous parvient de l'album Revenants, paru en 2014. On entend un WoW dans l'assistance. Et je crois que ça décrit très bien l'effet de surprise et d'enchantement face à la sélection de titres que Paul Lawler a soigneusement étoffée en une longue mosaïque, très dépendante de chacun des titres, qui s'écoule en une splendide symbiose, tant au niveau des rythmes que des harmonies, et qui fait abstraction des quelques 15 ans qui les séparent. “Arcane : Live @ E-day 2017” est un très bel album d'un concert qui me semble trop court afin de bien courtiser le vaste univers de Paul Lawler. Mais c'est un excellent début…. A captivating wave seize our ears, here the headset is of a big importance, with a slow balance which reminds these movements of waves which oscillate slowly in a long glass rectangle. The sound is full of small particles, like sound polyps, which sparkle around this wave which little by little unfolds a more musical influence. Other layers get grafted to this slow lunar waltz and the modulations become entangled like a one and only one sound entity which seems to be lost in the craters of the Sea of Tranquility. The movement is very slow and we have the impression to be sucked up by the void. Paul Lawler decorates here his floating layers of mechanical snores and of small parasitic noises which can fool the panic to a claustrophobic. By doing this, the slowness of the evolution of "Moon-1" seems to fool its chronometer. The slow movement caresses moments of pinnacles without sprawling there, teasing rather any rhythmic approach which will arrive by surprise around the 10th minute. Pulsations awake the atmospheres with sharp oscillations. A movement of sequences invites itself before the 12 minutes, sculpting a more fragile but so lively impulse, whereas melodious synth layers are wrapping this weak swiftness. "Moon-1" dives back into its mysterious mirages after the point of 15 minutes. The cosmic surroundings swallow this momentary rhythm, bringing back the title towards a ambiospherical heaviness where get lost other bits of sequences into the abysses dug by heavy and hollow layers. But everything is not still so black, nor of lost ambiences in the 2nd phase of "Moon-1". The 25th minute reveals a brighter sound scenario while the title sinks into one finale which is clouded of howling strata. Strata which get out of breath too fast and of which the respite let hear a plenitude of sound effects which sparkle in a last momentum of storm before the vibes get worn out into fractions of ambient rhythm which crumble between two ears bewildered by a music of lunar moods as much fascinating as the images of 2001: A Space Odyssey. At the level of the dark atmospheres, "Moon-2" is all the opposite of its older brother. More luminous and more orchestral, layers soaked of voices waltz around felted explosions and around interstellar noises. This music creates eddies of imagination in my head while small scenarios of movies follow this music which remains stuck on my earphones. 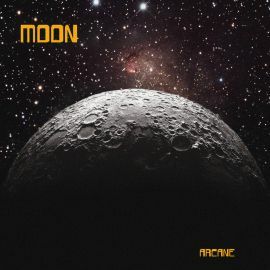 Shorter of more than 23 minutes, "Moon-2" gives the impression of being more fed by strikes of rhythms. But there's only one and a very beautiful one which appears in the bends of ear-catching lunar oscillations s little before the 9 minutes. The rhythm is supported by bass pulsations and pecked by metallic small wings which nibble at the vibes. The sequencer sculpts contiguous movements which spread delicious spasmodic lines. The percussions add more dynamism while the finale approaches at big step. A delicious final by the way where a piano more than charmer disperses its notes, like these rainy drops which get lost in the memory lapse. Here you are, you know now why I liked this “Moon” so much! An unavoidable album for fans of very luxurious and finely decorated lunar vibes and where the impossible seems to be at the tip of our dreams. Au niveau des ambiances ténébreuses, "Moon-2" est tout le contraire de son grand frère. Plus lumineux et plus orchestral, les nappes imbibées de voix valsent autour d'explosions feutrées et de bruits interstellaires. Cette musique crée des remous d'imagination dans ma tête alors que des petits scénarios de films suit cette musique qui reste collée à mes écouteurs. Plus courte de plus de 23 minutes, "Moon-2" donne l'impression d'être plus alimenté par des frappes de rythmes. Il y en a qu'une seule et une très belle qui surgit dans les courbes de séduisantes oscillations lunaires un peu avant les 9 minutes. Le rythme est soutenu par de basses pulsations et des élytres de métal qui grignotent les ambiances. Le séquenceur sculpte des mouvements contigus qui étendent des délicieuses lignes spasmodiques. Des percussions ajoutent plus de dynamisme alors que la finale approche grand pas. Une délicieuse finale en passant où un piano plus que charmeur éparpille ses notes, comme ces gouttes de pluie qui se perdent dans l'oubli. Voilà, vous savez maintenant pourquoi j'ai aimé ce “Moon” à ce point! Un album incontournable pour amateurs d'ambiances lunaires très somptueuses et finement décorées et où l'impossible semble être au bout de nos rêves. You always hesitate to discover Lambert's universe? Here is a good compilation that will guide you through his universe. Built between the albums Timeless Vision and Finis Terrae, this collection of 11 titles proposes a more accessible vision of the German synthesist music. 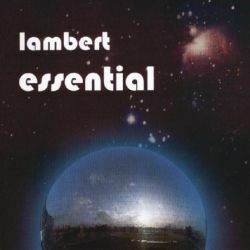 In this way, the selection of the titles doesn't always offer the best of Lambert, but well and truly the best of his two universes with very catchy titles and others more or less complex which show all of his skills to unstitch the ambiences with very good patterns of sequences which lead to polyphased rhythms. "Light Sky" starts things up with a good electronic rock structured on sequences in stroboscopic and spasmodic mode. Undulatory, the movement goes up and down while being supported by a solid and throbbing bass line and adorned of Bongo style percussions. This very New Berlin School structure supports a melody weaved in synth layers which make very TD, style Le Parc, and which fall in a rather abrupt way. Fans of Tangerine Dream, this is quite easy to manage. The first 2 titles come from the album Inside Out. If "Light Sky" goes down easy, "Sun" is more complex and present a creation more personal to Lambert's own style. The sequencer is always very active with evolutionary structures of rhythms which enchant in this universe wraps of mist and of good synth solos (Lambert is also very creative on synths) which inject orchestral effects. It's one of good titles of Inside Out, but not the best. The album Mirror of Motions is also represented by 2 titles. "Successive Pictures" is a meshing between Synth-Pop and E-Rock. The rhythm is lively and catchy. And the melody is just as much catchy and still here is forged between riffs and layers from Le Parc era. That makes at the same time Mark Shreeve and Tangerine Dream and even Mike Oldfield for the guitar. "Energetic" is heavy and slow with percussions which tumble down and hammer a movement of spheroidal sequences which is as much harmonious than the synth. At the beginning, that track reminded me of the Optical Race period, but the more I listen to and the more I hear the perfumes of Legend. Two tracks chosen in Dimensions of Dreams is not very representative of this excellent album. If "Return" is explosive at the level of the sequences and the percussions, "Two Worlds" is more experimental and possesses a very particular cachet for a so short title. I reviewed the album quite recently and it is by far Lambert's most accomplished opus. A short extract! A simple short extract of "Voyage to Nowhere" from the Trancesession album is waiting for our ears on this “Essential”. It's a pity and tell yourself that this album made with Stephen Parsick is an inescapable in the field of retro Berlin School. Four other titles are unknowns to me. Again here, it's an extract of "Open Sky" that Lambert proposes to us. Taken out of the album Finis Terrae, composed with Palantir, this extract offers a structure of a not completely ambient rhythm with sequences which skip in suspension in effects of wind instruments, the signature of Palantir. It's like to hear a music of the Schmoelling years of TD jumps in Linda Spa's vapors. If that doesn't really give a deep overview of the album, that sounds very good here. The extract of "White Light", from the Timeless Vision album made in collaboration of Jiannis has puts my ears on the alert. The introduction is eroded by a nebulous approach where hollow breezes and faded voices form a mixture of an underground sanctuary. The movement of sequences and the very TD layers which escape from there at the edge of the 3 minutes maintain these ambiences in the dungeons of The Keep. "Floating in Magic" is a title livened up by a movement of sequences which does its jogging with the harmonies of the morning birds. That sounds retro, just like "White Light" and 2 the titles which date of the end of the 80's. "Glider", an unpublished title, is a little ballad rather romantic with beautiful synth effects. Simple and cute, especially with the light arrangements which make spin the music, that's next to the style of ballads from the Melrose time. Vous hésitez toujours à découvrir l'univers de Lambert? Voilà une bonne compilation qui vous guidera à travers son univers. Construite entre les albums Timeless Vision et Finis Terrae, cette collection de 11 titres propose une vision plus accessible de la musique du synthésiste Allemand. Cela faisant, la sélection des titres n'offre pas toujours le meilleur de Lambert, mais bel et bien le meilleur de ses deux univers avec des titres très accrocheurs et d'autres plus ou moins complexes qui démontrent tout son talent pour découdre des ambiances avec de très bons patterns de séquences qui conduisent à des rythmes polyphasés. "Light Sky" ouvre le bal avec un bon rock électronique structuré sur des séquences en mode stroboscopique et spasmodique. Ondulatoire, le mouvement monte et descend tout en étant soutenu par une solide ligne de basse palpitante et orné de percussions de style Bongo. Cette structure très New Berlin School supporte une mélodie tissée dans des nappes de synthé qui font très TD, style Le Parc, et qui tombent de façon plutôt abruptes. Amateurs de Tangerine Dream, c'est un titre assez facile à gérer. Les 2 premiers titres proviennent de l'album Inside Out. Si "Light Sky" accroche sans souci, "Sun" est plus complexe et présente une création plus personnelle à Lambert. Le séquenceur est toujours très actif avec des structures de rythmes évolutives, qui enchantent dans cet univers recouvert de brume, et de bons solos de synthé qui injectent des effets orchestraux. C'est un des bons titres de Inside Out, mais pas le meilleur. L'album Mirror of Motions est aussi représenté par 2 titres. "Successive Pictures" est un maillage entre le Synth-Pop et le E-Rock. Le rythme est vif et entraînant. Et la mélodie, tout autant sinon plus accrocheuse, est encore forgée entre des riffs et nappes des années Le Parc ainsi qu'une guitare mélodieuse. Ça fait à la fois Mark Shreeve et Tangerine Dream et même Mike Oldflield pour la guitare. "Energetic" est lourd et lent avec des percussions qui déboulent et martèlent un mouvement de séquences sphéroïdales qui est aussi harmonieux que le synthé. Au début ça me rappelait la période Optical Race, mais plus j'écoute et plus j'entends les parfums de Legend. Les 2 extraits choisis de Dimensions of Dreams ne sont pas très représentatifs de cet excellent album. Si "Return" est explosif au niveau séquences et percussions, "Two Worlds" est plus expérimentale et possède un cachet très particulier pour un titre aussi court. J'ai chroniqué l'album tout récemment et c'est de loin l'album le plus accompli de Lambert. Un court extrait! Un simple court extrait de "Voyage to Nowhere", tiré de l'album Trancesession, attend nos oreilles dans “Essential”. C'est dommage et dites-vous cet album réalisé avec Stephen Parsick est un incontournable dans le domaine du Berlin School rétro. Les 4 autres titres sont des inconnus pour moi. "Open Sky (Extract)" de l'album Finis Terrae, fait avec la collaboration de Palentir, offre une structure de rythme pas tout à fait ambiant avec des séquences qui sautillent en suspension dans des effets d'instruments à vent, la signature de Palentir. C'est comme entendre du TD des années Schmoelling sautiller dans les vapeurs de Linda Spa. Ça ne donne pas vraiment une idée de l'album, mais ça sonne très bien ici. L'extrait de "White Light", de l'album Timeless Vision en collaboration de Jiannis met mes oreilles en alerte. L'introduction est érodée par une approche nébuleuse où brises caverneuses et voix éteintes forment un mélange de sanctuaire souterrain. Le mouvement de séquences et les nappes très TD qui s'en échappent à l'orée des 3 minutes maintiennent ces ambiances dans les donjons de The Keep. "Floating in Magic" est un titre animé par un mouvement de séquences qui fait son jogging avec les harmonies des oiseaux matinaux. Ça sonne rétro, tout comme "White Light", 2 titres datant de la fin des années 80. "Glider", un titre inédit, est une petite ballade plutôt romanesque avec de beaux effets de synthé. Simpliste et mignon, surtout avec les légers arrangements qui font virevolter la musique, ça s'inscrit dans le style des ballades de l'époque Melrose. 1995! That year was a turning point in Lambert Ringlage's career who leaves his adventure in solo to realize works in duet with Stephen Parsick, Palantir and Wolfgang Barkowski. This period, nevertheless festive for the fans of the New Berlin School style, was going to be punctuated with numerous interruptions which today always stay without explanations. 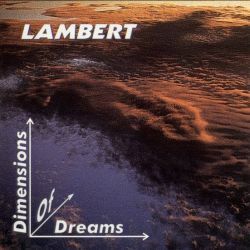 But before this change of cape in his career, Lambert had another surprise to give to EM; “Dimension of Dreams”. Another album always strongly inspired by Tangerine Dream, from the Virgin to the Melrose years, this 8th solo album of the founder of Spheric Music the label took a tangent which was going to infiltrate the waves of Trancesession, another excellent album of the Berlin School style that I recommend strongly. "Impetus" starts things straight with a superb and very harmonious structure of sequences where Lambert has nothing eft to learn from Chris Franke. The rhythm is solid, lean on this movement of sequences and on sober electronic percussions very MIDI, and supports a melody of a synth of the 90's which spreads crepuscular shadows and which sounds very TD of the Virgin years. The play of the sequencer takes our ears by surprise with some unexpected directions and the synth sculpts solos worthy of an electronic nightingale. An excellent start, which rings a little bit retro today except that the sequencer and the synth solos always stay of an incredible efficiency. After this canon start, Lambert offers us 4 long and rather creative compositions. First of all, "Trance Journey" and its introduction which mixes well enough the baroque style of the keyboard and the theatrical effects as misty as a wolf with its sneaky approach. A crystalline movement of sequence makes its keys to frolic and to skip in a sophisticated disorder whereas a bass line accentuates the uncertain approach of the introduction. Minimalist, this structure of rhythm welcomes cosmic effects and another line of sequences which sounds more than very discreet in the background. This more or less ambient movement reaches a surprising phase of intergalactic fight with an assault of sequences which gives a video game aspect to a music which eyes a little the kind of trance ambient before taking back a more Berliner path. And as usual, Lambert decorates his music of very good solos. "Immersion" is more in an electronic rock mode with Andreas Paeth on guitar who throws wonderful and furious solos which tears up the vibes around. "Translook" is a splendid Berlin School which has inspired, or is it vice versa, the moods of the succulent album Trancesession. Sequences and percussions, which sound more real here, sculpt a minimalist approach which a strong bass line straddles marvelously. The ambiences turn to a very dark kind, a la Redshift or ['ramp], around the 6th minute. A short passage of 2 minutes as staggering as deeply delicious, the synth layers smother of their effects of old organ, before the rhythm becomes again a good Berlin School which undulates like the hypnotic S of a long snake. "Train of Impressions" is another very good track which is so much like TD, period Logos. I know that there is a multitude of Tangerine Dream's emulators out there who get multiply since the coming of the MIDI era, but I rarely heard a version as well near the era Logos as here. Incredible! When I'm reading here and there that Lambert Ringlage became as good as Chris Franke in the manipulation of the sequencer, “Dimension of Dreams”, and especially "Train of Impressions", is doubtless at the origin of this statement. Afterward, the album takes another tangent with a series of short titles which seem very pale after these last exceptional 45 minutes. "Maelstrom" is without stories while "Two Worlds" is more experimental and clearly more interesting here. Even with very heavy layers and a rather ambivalent structure of rhythm, "Yonohamo" had no effect on me, set apart to skip it and jump to "Return". That's a very explosive title which concludes Lambert Ringlage's most elaborate and most musical album to this date. There is nearly 60 minutes of strong, very strong, music in this “Dimension of Dreams”, one of the best albums for those who always look for and still are looking for some very sophisticated and creative pupils of Tangerine Dream. If it's the case, run for this album! 1995! Cette année marque un tournant dans la carrière de Lambert Ringlage qui quitte son aventure en solo pour réaliser des œuvres en duo avec Stephen Parsick, Palantir et Wolfgang Barkowski. Cette période, pourtant festive pour les fans du style New Berlin School, allait être ponctuée de nombreuses interruptions qui aujourd'hui restent toujours sans explications. Mais avant ce changement de cap dans sa carrière, Lambert avait une autre surprise dans son coffre; “Dimension of Dreams”. Un autre album toujours fortement inspiré par Tangerine Dream, des années Virgin à Melrose, ce 8ième album solo du fondateur du label Spheric Music prenait une tangente qui allait infiltrer les ondes de Trancesession, un autre excellent album du genre Berlin School que je recommande fortement. "Impetus" ramasse nos oreilles avec une splendide structure de séquences très harmonieuse où Lambert n'a plus rien à apprendre de Chris Franke. Le rythme est solide, appuyé par ce mouvement de séquences et de sobres percussions électroniques très MIDI, et supporte une mélodie d'un synthé des années 90 qui étend des ombres crépusculaires et qui font dans le très TD des années Virgin. Le jeu du séquenceur déculotte les oreilles avec des directions inattendues et le synthé sculpte des solos digne d'un rossignol électronique. Un excellent départ, qui sonne un peu rétro aujourd'hui sauf que le séquenceur et les solos de synthé restent toujours d'une incroyable efficacité. Après ce départ canon, Lambert nous offre 4 longues compositions assez créatives et qui ont superbement bien vieillies. Tout d'abord "Trance Journey" et son introduction qui mélange assez bien le style baroque du clavier et des effets théâtraux aussi nébuleux qu'un loup avec sa démarche sournoise. Un mouvement de séquence cristallin fait gambader ses ions qui sautillent dans un désordre raffiné tandis qu'une ligne de basse accentue la démarche tâtonneuse de l'introduction. Minimaliste, cette structure de rythme accueille des effets cosmiques et une autre ligne de séquences qui se fait très discrète. Ce mouvement plus ou moins ambiant atteint une étonnante phase de combat intergalactique avec un assaut de séquences qui donne un aspect jeu vidéo à une musique qui lorgne un peu le genre transe ambiant avant de reprendre une route plus Berliner. Et comme toujours, Lambert orne sa musique de très bon solos. "Immersion" est plus en mode rock électronique avec une furieuse guitare d'Andreas Paeth qui déchire les ambiances avec de furieux solos. "Translook" est un superbe Berlin School qui a dû inspiré, ou vice-versa, les ambiances de Trancesession. Les séquences et les percussions, qui font plus réelles ici, sculptent une approche minimaliste qu'une solide ligne de basse encadre à merveille. Les ambiances virent au genre très ténébreux à la Redshift ou ['ramp] autour de la 6ième minute. Un passage aussi renversant que délicieux, les nappes de synthé étouffent avec leurs effets de vieil orgue, d'une durée de 2 minutes avant que le rythme ne redevienne un bon Berlin School aussi ondulant qu'un long serpent et ses s hypnotiques. "Train of Impressions" est un autre très bon titre qui fait trop TD, période Logos. Je sais qu'il y a une multitude d'émules de Tangerine Dream qui fait rage depuis la venue des équipements MIDI, mais j'ai rarement entendu une version aussi près de l'ère Logos qu'ici. Incroyable! Lorsque je lis ici et là que Lambert Ringlage est devenu aussi bon que Chris Franke dans le maniement du séquenceur, “Dimension of Dreams”, et surtout "Train of Impressions", est sans doute à l'origine de cette affirmation. Par la suite, l'album prend une autre tangente avec une série de courts titres qui paraissent bien pâles après ces 45 dernières minutes exceptionnelles. "Maelstrom" est sans histoires alors que "Two Worlds" est plus expérimentale et nettement plus attrayant. Même avec des nappes bien pesantes et une structure de rythme plutôt ambivalente, "Yonohamo" n'a eu aucun effet sur moi, mis à part de le sauter et passer à "Return". Un titre très explosif qui conclut l'album le plus élaboré et le plus musical de Lambert Ringlage. Il y a tout près de 60 minutes très costaudes dans “Dimension of Dreams”, un des meilleurs albums pour ceux qui recherchent toujours et encore des élèves et des descendants très raffinés et créatifs de Tangerine Dream. The joys of being a reviewer is to obtain small unexpected jewels. I already spoken to you about Sula Bassana in my review of The Ape Regards His Tail with even the promise that I would write soon to you about Dave Schmidt, the multi-instrumentalist behind Sula Bassana. I was translating my review of The Ape Regards His Tail while listening absently to “Organ Accumulator”. I already knew that I was going to like it! Released in vinyl format on the Deep Distance label in January 2017, “Organ Accumulator” was produced in CD format 2 months later on the Sulatron Records label with a bonus section which included the side A of a vinyl made in collaboration with 3 AM in 2014, Disappear-Waves. And you will notice that as additional material, Sula Bassana couldn't find any better to complete the virgin lines of a CD which is simply exceptional. An ascent of shrill sounds announces "Lichtbündel". Elytron of metal, an insistent bass and layers of guitars launch the base of this opening where very quick the music hits a bubble of psychedelic effects. It's at this moment that "Lichtbündel" starts revealing the charms of “Organ Accumulator”. The rhythmic is hopping, sat on bass pulsations and on atypical percussions, the ambiences are weaved on the quivering waves of an old organ. Like in the time of Klaus Schulze! Navigating between phases of ambiences with strange flavors of old Babylon and phases of rhythm which skip with more of mordant, "Lichtbündel" pushes my ears in the vintage years but with a contemporaneousness in the tones which sounds like a very reinvented Krautrock. "Morgentau" is simply bloodthirsty with its dark rhythm which skips as a walking where the feet float more than they move forward over a delicious carpet of old organ. There is a form of intensity here that one will recognize some listening later. It's a delicious soporific walking, the hits of clogs on the road sound like some used wood, wrapped by a vampiric wave of sounds. "The Frogs" offers a curt rhythm with percussions as sober as these keyboard chords which are so like those of Rick Wright in the good old days. The bass is good here and solidifies this structure where the psychedelic effects abound with good reverberating effects and strata of synth, or is it guitar, of which the mixture gives a shape of werewolf which is resigned to the only remaining food … frogs. The title-track sounds out of tune here with a very livened motorik structure up which grows by taking the shape of a very good big rock juicy its riffs. Lively, a little bit wild and very unexpected! "Grashamster" proposes an introduction in mode ambience, even with these felted percussions which have difficulty to hide a strange murmur and which forge an approach slightly motorik. The rhythm spreads a growth which reaches a velocity noisier than rhythmic with effects and sonic spasms which inhale marginality. And in spite of this aspect, this title pushes away a melody which will show the tip of its notes after some listenings. This is very good! "Nebelschwaden" ends “Organ Accumulator” with a slowly stroboscopic approach. One would say a march thought by Vangelis but played by Tangerine Dream and mixed by Steven Wilson. It's slow, like an odyssey towards more or less abrupt tops, with a sound texture as melodious as these songs that we sing non-stop when our body is doing something hard physically. This is very beautiful! It's like if we were stoned to the bone and we are skipping in space with celestial bodies and stars as musicians without borders. And the effect of organ here is more attractive than vicious. As I wrote higher, “Organ Accumulator” becomes “Organ Accumulator / Disappear” with the addition of the face A, Disappear, from the vinyl Disappear-Waves. If "Grong" is a big juicy and spasmodic Krautrock and that "Smoof" is a title of funeral ambiences on a slow and mesmerizing rhythm, "Disappear" is the protruding fact of this bonus set with an attractive delicately stroboscopic structure with its full of distortions from a six-strings as hostile than very ethereal. Layers of voices stick to these oddities of the guitar and of its guttural harmonies, pushing "Disappear" towards a delirium of moods which ends with a fuming approach just as much lively than a delicious and melodious psychedelic synth-pop. The road is splendid of sounds and effects of guitars, in particular those beautiful harmonious loops just as in Michael Rother's repertoire, before arriving at this delicate explosion of rhythm which is expected and not disappointing at all. A little like the finale of the title-track. Les joies d'être chroniqueur est de frapper des petits bijoux inattendus. Je vous avais déjà parler de Sula Bassana lors de ma chronique sur The Ape Regards His Tail avec même la promesse que je vous parlerais bientôt de Dave Schmidt, le multi-instrumentaliste derrière Sula Bassana, alors que je traduisais la chronique sur The Ape Regards His Tail tout en écoutant distraitement “Organ Accumulator”. Déjà, je savais que j'allais aimer cela! Réalisé en format vinyle sur le label Deep Distance en Janvier 2017, “Organ Accumulator” a aussi été réalisé en format CD 2 mois plus tard sur le label Sulatron Records en incluant la Face A du vinyle réalisé avec 3 AM en 2014, Disappear – Waves. Et vous allez constater que comme matériel additionnel, Sula Bassana ne pouvait trouver mieux afin de compléter les lignes vierges d'un CD qui est tout simplement exceptionnel. Une montée de sons stridents annonce "Lichtbündel". Des élytres de métal, une basse insistante et des nappes de guitares constituent la base cette ouverture où très vite, la musique se bute à une bulle d'effets psychédéliques. C'est à cet instant que "Lichtbündel" dévoile ses charmes. La rythmique est sautillante, montée sur des basses pulsations et des percussions atypiques, et les ambiances sont tissées sur les ondes tremblotantes d'un vieil orgue. Comme dans le temps de Klaus Schulze! Voguant entre des phases d'ambiances aux étranges parfums du vieux Babylone et des phases de rythme qui sautillent avec plus d'incision, "Lichtbündel" enfonce mes oreilles dans les années vintage mais avec une contemporanéité dans le ton qui fait très Krautrock réinventé. "Morgentau" est tout simplement sanguinaire avec son rythme sombre qui sautille comme une marche où les pieds flottent plus qu'ils avancent sur un délicieux tapis de vieil orgue. Il y a une forme d'intensité ici que l'on reconnaitra après quelques écoutes. C'est une délicieuse marche soporifique, même les coups de sabots sur la chaussée sonnent comme du bois usé, enveloppée d'une onde de sons vampirique. "The Frogs" offre un rythme sec avec des percussions aussi sobres que ces accords de claviers qui font comme du bon vieux Rick Wright. La basse est bonne ici et solidifie cette structure où les effets psychédéliques abondent avec de bons effets réverbérant et des strates de synthé, ou est-ce de guitare, dont l'amalgame donne un éclat de loup-garou qui est résigné la seule nourriture restante…les grenouilles. La pièce-titre détonne avec une structure motorik très animée qui croît en se chaussant d'un bon gros rock bien juteux de ses riffs. Enlevant, un peu sauvage et très inattendu! "Grashamster" propose une introduction en mode ambiances, même avec ces percussions feutrées qui peinent à cacher un étrange murmure et qui forgent une approche légèrement motorik. Le rythme étend une croissance qui atteint une vélocité plus bruyante que rythmique avec des effets et des spasmes sonores qui respirent la marginalité Et malgré cet aspect, ce titre refoule une mélodie qui n'apparaitra pas avant quelques écoutes. Très bon! "Nebelschwaden" termine “Organ Accumulator” avec une approche lentement stroboscopique. On dirait une marche pensée par Vangelis mais jouée par Tangerine Dream et mixée par Steven Wilson. C'est lent, comme une odyssée vers des cimes plus ou moins abruptes, avec une texture sonore aussi mélodieuse que ces chansons que l'on chante sans arrêt lorsque notre corps est occupé à faire quelque chose de dur physiquement. C'est très beau! C'est comme si on était gelé à l'os et que l'on sautillerait dans l'espace avec des astres et des étoiles comme musiciens sans frontières. Et l'effet d'orgue ici est plus séduisante que vicieuse. Comme j'écrivais plus haut, “Organ Accumulator” devient “Organ Accumulator / Disappear” avec l'ajout de la face Disappear du vinyle Disappear – Waves. Si "Grong" est un gros Krautrock juteux et spasmodique et que "Smoof" est un titre d'ambiances funéraires sur un rythme lent et envoûtant, "Disappear" est le fait saillant de cet ensemble boni avec une séduisante structure délicatement stroboscopique avec son plein de distorsions de six-cordes aussi malveillantes qu'éthérées. Des nappes de voix se collent à ces bizarreries de la guitare et de ses airs gutturaux, poussant "Disappear" vers un délire d'ambiances qui se termine avec une fumante approche de synth-pop psychédélique entraînant et mélodieux. La route est superbe de sons et d'effets de guitares, notamment de belles boucles harmoniques à la Michael Rother, avant d'arriver à cette délicate explosion de rythme qui est aussi attendue que non décevante. Un peu comme la finale de la pièce-titre. 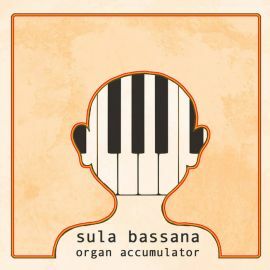 “Organ Accumulator / Disappear” est un solide album de Sula Bassana. C'est un album très différent de The Ape Regards His Tail à cause de sa texture plus en rythme qu’en ambiance et de sa fusion entre les différents styles qui éclataient la petite planète musique dans les années 70. Il y a du Berlin School, du Koshmik Rock et du bon Krautrock enveloppés dans un combat entre les années vintages et celles plus modernes avec des rythmes entrainants et bizarroïdes qui laissent toujours une petite place à des mélodies que l'on remarque un peu plus tard. Très bon et je le recommande fortement. Il a déjà sa place dans mon Top 10 de 2017!